Open all week during the Easter holidays 7 - 24 April and during the English school hoidays from Monday 24 July - Sunday 3 September. .
Have fun and learn about the history of Berwick-Upon-Tweed as you walk through the alleys of the old town recreated in the Window on Berwick displays. Meet some of its fascinating characters and find out about the old ways of life including the Mayor’s power to sentence to death! Peep into homes, shops and other commercial properties before visiting The Red Lion – just one of 103 town taverns in 1870. Find out how the land and sea shaped the industries from agriculture to mining and fishing to seaside resort and spa. Be transported back to the turbulent Middle Ages and find out about the weaponry and fortifications of this strategic border town. Discover Medieval religious beliefs too illustrated with beautiful objects from the Burrell Collection. Appreciate the stunning collection of art and decorative items bequeathed to the people of Berwick by shipping magnate Sir William Burrell in the 1940s. 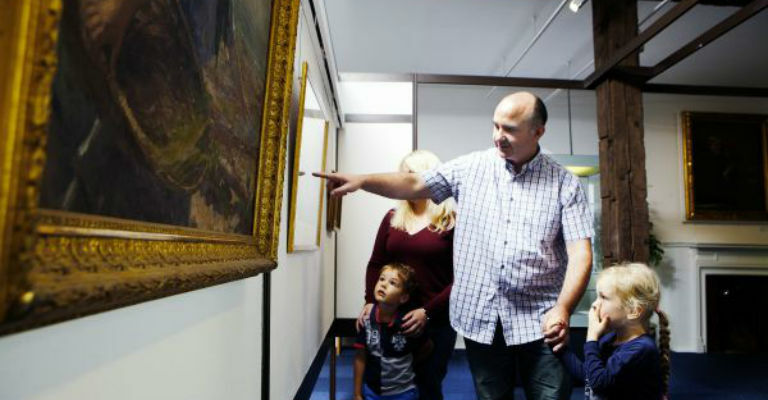 Featuring works by Boudin and Maris, ancient Roman and Venetian glass, Japanese imari pottery and Ming porcelain, the Berwick Burrell Collection is the most important art collection in public ownership in Northumberland. Special education resources have been developed in association with this exhibition. Find out more and download them here.